Keep in mind, that this project still has many hurdles still to overcome before it will be made available. Mazda gave every audio enthusiat a high quality radio when it decided to use it common FMS Audio Head unit across all of its platforms in 2003. While already very common at the time, Mazda made an impressive move to standardize all of the radio components internal parts across their entire product line. The only differentiation between these units was the model specific radio shell styling, button layout and the graphic display. Even the Climate Control were integrated into the Head Unit. 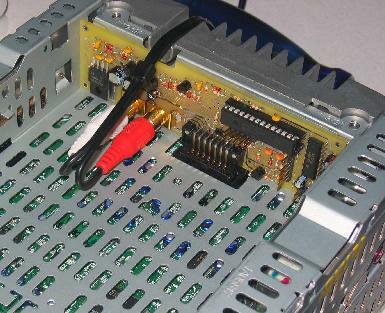 All of the modules common components such as: the Base Amplifier and Radio Tuner, the Add-in CD player, CD Changer, MP3 CD player, Tape Deck and MiniDisk players are all interchangeable parts. In addition there are further model specific options for Navigation and TV tuners (avalable only in some selected models and markets). While this did result in a noticeable inprovement in overall system quality, it also locked in people who wanted to connect something to the audio system that was not already specifically designed into the system in Mazdas plan. With an Auxillary line in you can connect your portable MP3 player, Satallite radio reciever, In-Car Computer or even your Cell Phone to the factory sound system. This was the focal point in the creation of the AuxMod. It is a key building block to integrating audio into a modern Mazda Head unit. It is designed, in its simplest form to be but a simple pair of RCA line-level input jacks. In order to allow the system to accept audio from the unit, it emulates a Tape module in the simplest form, and has limited capability to perform other functions. In its greatest incarnation, it allows the user to interface a PC with the Head Units control bus, meaning that you can send remote commands to an In Car Computer (also known as a CarPuter). It will also allow the remote control functions to several hard disk based mp3 players, providing a seamless and clean integration to a fully functional car kit. In addition, expansion modules beyond that of the mp3 connection allow the user to expand the number of available audio input channels through the use of an Audio break-out connection. Why are there two different variants of the AuxMod unit? The market has several sets of requirements. The first set is to to make the cost of the basic module to consumers as low as possible while still providing a quality product. The demand is for a simple unit with no-frills that accomplishes the simple task of high-fidelity in-car auxillary audio without any unnecessary features. At the same time, there is another demand for high-end features that simply can not be otherwise integrated into a factory Head Unit. Hard Disk based MP3 player controls can be used to advance to the next track of your MP3 player from the steering wheel button controls, or remotely controling WinAmp on a PC with pre-existing plugins from the steering wheel, or Head unit buttons. Multiple switchable Audio Inputs are another request that is being looked for, to supply audio from an in-car Playstation, Xbox, PC and DVD player to the factory stereo all at the same time.